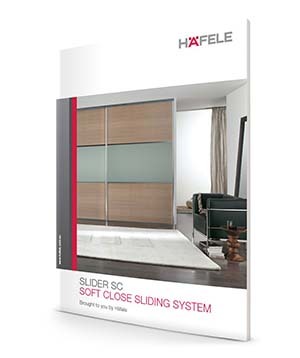 Designed by wardrobe manufacturers for wardrobe manufacturers, the Slider SC soft close sliding system is a new innovation from Häfele that will bring a touch of luxury to any home. Take one look at the SC Slider in action, and you’ll see why it’s ideal for just about any application – from lobby to boudoir. Why? Not only is the SC Slider a system that allows you to create the smooth lines that hinge doors can’t, it also makes sliding heavy 50 kg wardrobe doors feel light and effortless. And with a soft-close mechanism cleverly concealed into the top guiding track, operation is silent, efficient and guaranteed for years to come. It's perfection. The SC Slider is supplied packaged into opening sets or as loose components, so it’s also easy on your budget too. Everyday luxury. Comfortable Price. Don’t start your next project without it.